Google has always been the first choice for each user due to its advance facilities, which are offered such as Gmail, Google’s suite (formerly Google Apps), Google Drive, etc. 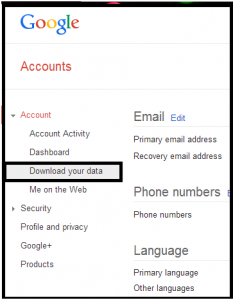 One of the most useful feature is Google Takeout, which makes easy for them in downloading the data from Google account to an offline mode. Due to this, there are numerous of users who prefer to store their data by using Google Takeout that extracts the complete data in a ZIP file. However, Most of them wish to import the downloaded data to their Gmail account that makes easy for them to access the same information in Gmail account. In the following section, we will discuss a way to import Google Takeout to Gmail or Google’s Suite. Most of users need to export their data from Google application, i.e. Gmail then, Google Takeout is the best option. It gives an option for users to select data items that are required to be exported. Once selected, the service starts downloading the data from your account. Thus, users can select desired data item to extract, i.e. emails, contacts, bookmarks, YouTube, Google Drive, Google Calendars, etc. 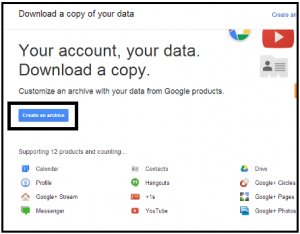 There are many more items associated with Google account that can be downloaded by Google Takeout service. It downloads the selected data and save them into a ZIP folder, which is saved at local location. 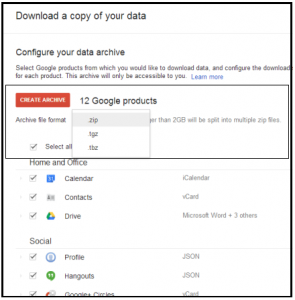 Google Takeout is a facility by Data Liberation Front, an engineering team at Google that aims in making it at ease for users for moving the data in and out from Google. There are some steps that makes easy for users to import Google Takeout to Gmail or G Suite (Google apps). Step 6: Once you select ‘create archive’ button, you will automatically get logged out from the account. Now, again log in to the account and a zip file of all your data will get downloaded on system. All the mails of Gmail are stored in .mbox file format along with its attachments MBOX file format is supported by various email applications such as Thunderbird, Outlook 2011 for Mac, Apple Mail, Entourage, etc. Single MBOX file is created for all the mails by default. Google Takeout makes easy for users by storing the data either by three times or seven times in a week. Google calendars stored in ICS file format. Out of which, iCalendar is one of the most widely used mode for storing as well as sharing calendars across the internet. There are numerous of web-based and desktop-based applications that open and read ICS file. vCard: Contacts are stored into vCard .vcf file format by default. It is an electronic business card, which is compatible with various email applications as well as other devices. HTML: HTML is the most suitable file format to open any file in web-browse. When the contacts get stored in HTML file format, it makes easy to import them into other Contacts Management Software. CSV: CSV is a Comma Separated Values file that can be opened in MS Excel. Therefore, there is an advantage to store contact details in a managed form via spreadsheets. DOCX: MS Word 2007 and later versions stores as well as read its data in DOCX file. ODF: The open source word processors like LibreOffice or OpenOffice read an ODF file (Open Document Text). Rich Text: This format is read by word editors such as Word, Notepad, etc. Most of the RTF file readers do not contain the formatting options. PDF: Portable Document Format is one of the simplest file format to open, read, and view the data. With free Adobe Reader, PDF files can be read on Windows as well as Mac OS. Plain Text: Documents with text but without any formatting is the plain text. 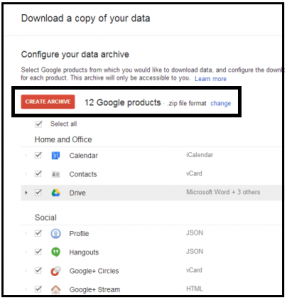 Google offers numerous of features that makes easy for users to manage their data accordingly. Out of which, one such is Google Takeout. In the above discussion, we have discussed a way to import Google Takeout to Gmail or G Suite (Google Apps).